Dimensions specify the data returned when you run your query. But what do you want to do with all that data once you have it? In some cases, the answer might be: nothing. Simply gathering the data and being able to view and analyze it might be enough. In that case, you might not care about measures. At other times, however, you might have specific questions you were hoping the data could answer. For example, you might want to know how many users registered during each of the last six months, or how many users you have from each country in South America, or maybe how many users are signing on by using a cell phone as opposed to signing on by using a PC. Measures help answer these questions. The default Explores that ship with Customer Insights all include the Count measure, which simply tallies up the number of whatevers (a count of all the users registered during the last six months, a count of all the users from each country in South America, etc.). For much of the data that gets imported into Customer Insights the Count measure will suffice. For those instances where it doesn’t, you can create your own measures by adding table calculations to your query. 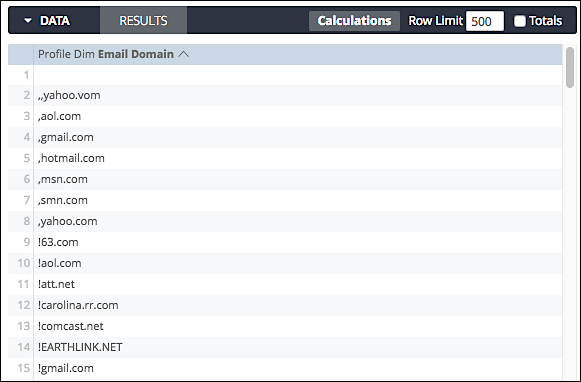 As you can see you, this is just a list of the email domain for each user profile in the database. If we displayed the entire dataset, we’d see a table with over 11 million rows. That’s … interesting … but it’s difficult to draw many conclusions from a table like that. Now we can draw some conclusions: gmail.com is the most-commonly used email domain in our database, followed by hotmail.com and yahoo.com. To add this capability to a query, just click the appropriate Count measure. And yes, the word appropriate is important. If you are counting profile-related information then use the Count measure from the Profile Fact Explore. If you are counting event-related information, use the Count measure from the Event Fact Explore. Doing anything else will lead to unexpected (and usually incorrect) results. That means that only a single data point comes back: the total number of user profiles in the database.